To most, being asked to gain weight would be a cause for celebration. For me, and probably the majority of those suffering from ED, it can create a lot of anxiety and fear. A lot of my ED days especially in the early years involved planning meals to a tee. And I would plan around those mealtimes so that I would be distracted from the thought of eating and ignore any whimper of hunger that my stomach might be sending to my brain. When I started to get treatment, eating out made me highly anxious. What if there’s nothing I want ED wants to eat? What if everything there is calorie-laden? What if they eat too early? Too late? Hmm.. Maybe I won’t go. I’ll just stay at home to eat. Or maybe I’ll meet my friends, say I have something one and come home for dinner. Or maybe I’ll eat then meet my friends. Or maybe I’ll just tell my friends I’ve eaten, and tell Mum and Dad I’m eating out, and then not eat at all! As I went through phases of recovery, I would push myself to go out for meals with friends or family. It wasn’t easy and often, I would back out. Over time though, I realised that there would always be something on the menu for me that I felt comfortable with. That didn’t mean that I had got rid of ED. It just meant that ED gave me ‘allowances’ and I constantly opted for safe foods while marvelling at how my beautiful friends could eat such ‘sinful‘ food, clean their plates, and still be far from overweight. Funnily enough, that’s how I used to eat too, before ED. But over the years, ED blinded me to what normal, healthy, balanced eating is, and pulled me into its deception that I was different, that I was better because I could resist temptation, that I was strong because I was not greedy, that I needed less to be more. The last week or so have been challenging but also rewarding. Flo has been pushing me to finish my food, carbs included, and while it doesn’t make me ED feel good, I know that it is only to my benefit. 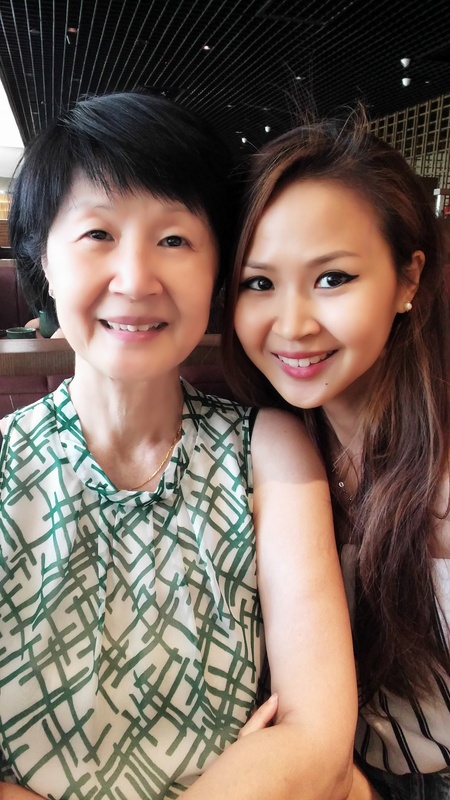 Last Friday, I had a lunch date with Mum and I was hankering after Japanese! So Sushi Tei it was. Usually, I’d order my usual seafood soup and Mum would go for a main, and we would share a mini roll. While a part of me was pulled towards sticking to what’s usual and comfortable, I found myself swerving away from that lure and suggesting that we order a few dishes to share instead. 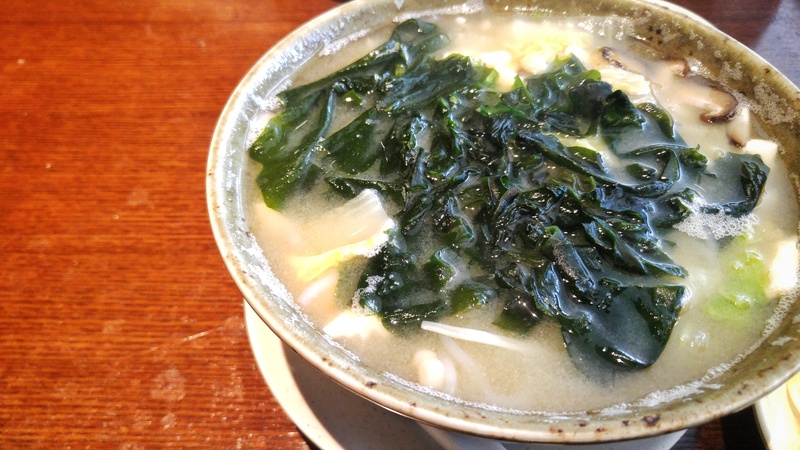 We had a Vegetable Miso Soup which came piping hot and wrapped itself around us in a lovely warm hug. 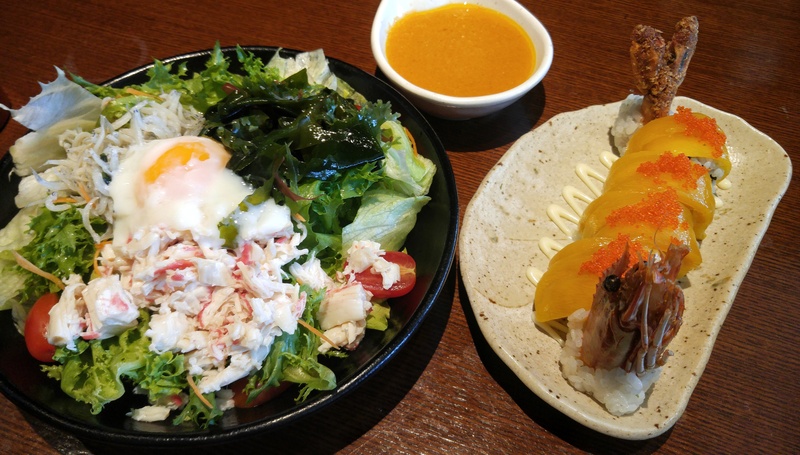 We also shared a Shirasu and Kani Tappuri Salad – Baby Sardines, Crab Flakes, Seaweed and an Onsen Egg on a bed of fresh Salad Greens with Sushi Tei’s house dressing on the side, and a Mini Golden Roll. The sweet mango and fried jumbo prawn combo never fails to delight, nor make me feel guilty. But it was so good! And that gorgeous, perfectly cooked onsen egg! 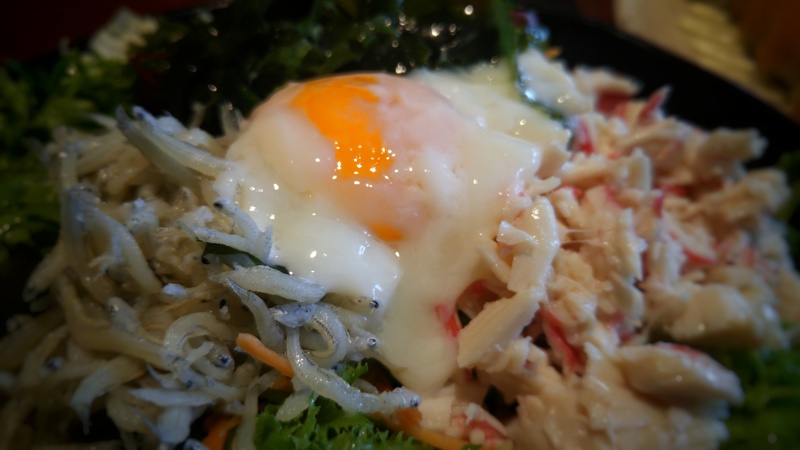 With the sweet chunky flakes of crab! This was love. With my gorgeous Mama! 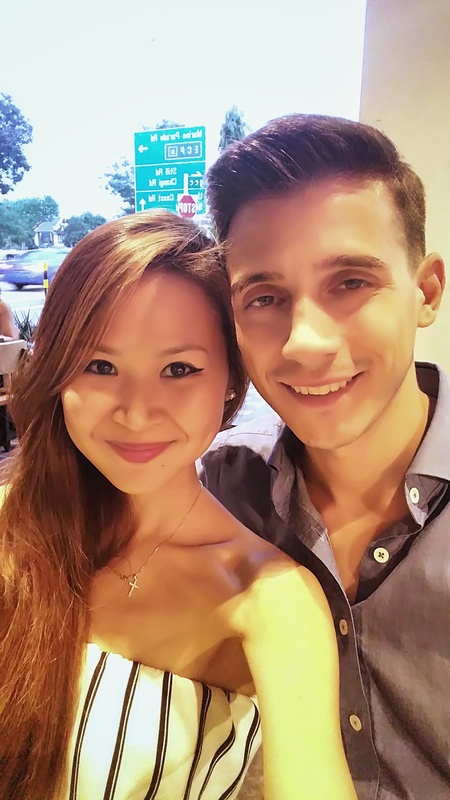 It was a wonderful day out with her as we scoured the malls of Orchard Road looking for something for Aunty Aud’s birthday – we came up empty-handed in the end. But it felt good spending quality time with Mum and then going for tea before we parted ways to head home. Days like these remind me of how infinitely blessed I am to have a mother as beautiful inside as she is on the outside. Mum’s strong, self-assured, confident and still, she has a heart that is rich in compassion and love. While we do not always see eye to eye on everything, there is a whole lot of love between us! The same day, I had a long-standing reservation with a quite recently-opened restaurant a short bus ride away from where Flo and I live. 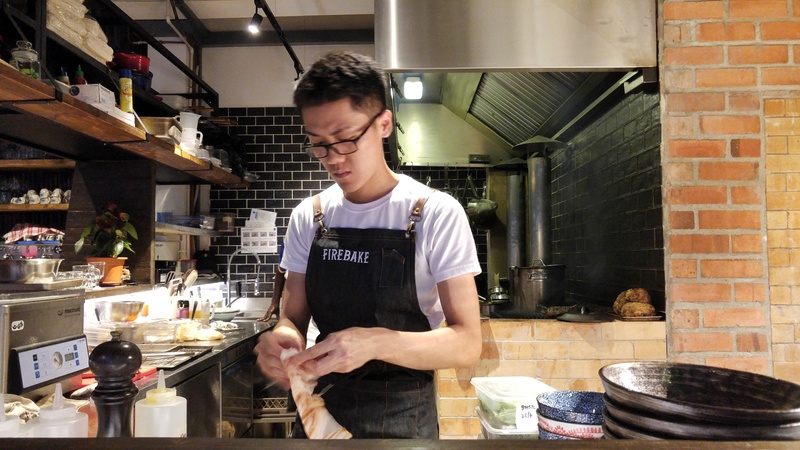 Flo and I met at FireBake in the evening where it was already quickly filling up with hungry customers. We started off with their Bread board which is what FireBake is known for. 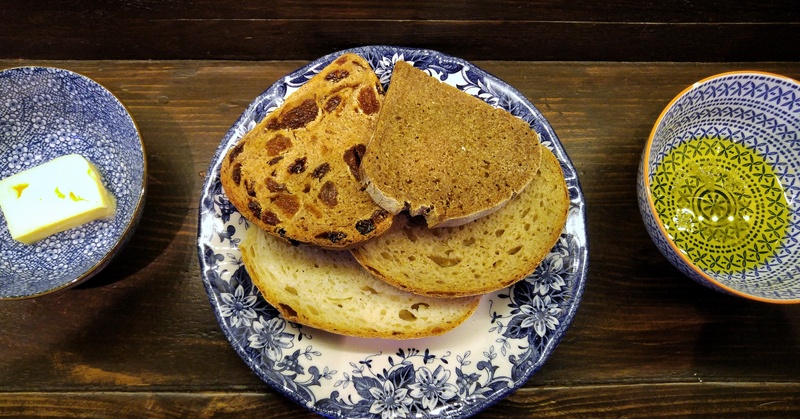 4 slices of sourdough bread – Dried Fruit, Rye, Wholemeal and White, alongside fruity Greek extra virgin olive oil and Norwegian Butter. As any mother would say of her children, they were all special in their own way. The rye sourdough had a lot of character with its intense sour, nutty flavour, while the wholemeal and white were lighter and chewier. As for the sourdough fruit slice, it reminded me a lot of Fruit cake, which isn’t a bad thing for some – almost like dessert. 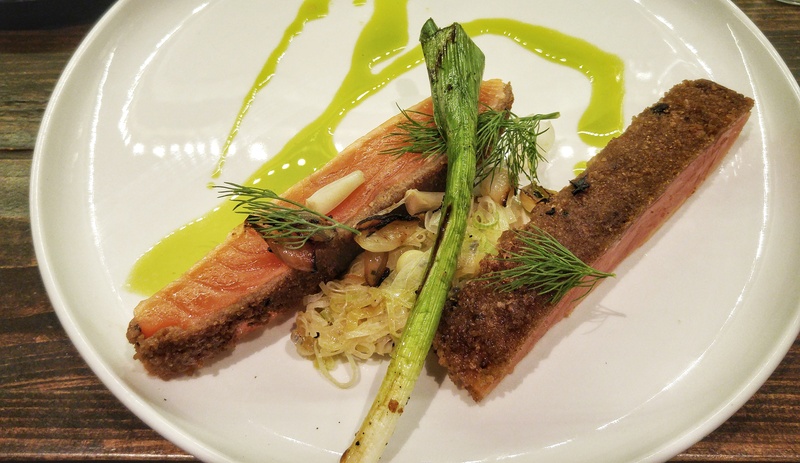 For mains, I arrowed straight for the Cured Norwegian Salmon with Bread Crust, Dill, Leek and Pickled Onion. The cured salmon was perfectly cooked and not too salty at all. The bread crust had some garlic powder in it I believe and reminded me a lot of something I must have eaten when I was a kid. It was different having the salmon with a breaded crust instead of crispy skin and I found myself missing that. The vegetables while well-executed were a little on the oily side to me. Honestly, I was tempted to stop eating halfway because I felt like there was too much food on my plate, but with Flo’s encouragement, yes, I did finish everything. ED had regrets for sure. On my part though, I can’t say I had any because the salmon was simply on point. Flo’s hunger took him to go for the Rangers Alley Stripling 300g which came with Jerusalem Artichokes and Chimchurri Sauce. It came medium rare as requested and was well-seasoned and juicy. Flo did comment after that it was a little tough to chew on and for some reason, he was lusting after lots of water after the meal. The artichokes though, were an interesting side to the meal – they were earthy and had just a touch of sweet, almost like a cross between a potato and a parsnip. We were seated at their counter so we had a good view of their open kitchen where all the action happens. I’ve worked in hot kitchens before but I have to say that an open kitchen is probably a lot more pressurising with nosy customers like me watching the cooks’ every move. Moreover, the head chef has to be more calm and controlled in this kind of environment, and the one running this kitchen most definitely was. Kudos to him and his team! 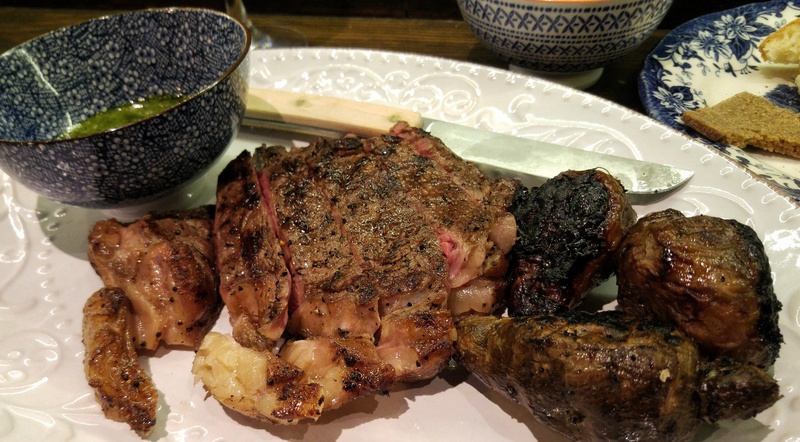 It was an enjoyable meal and while we’re not sure when we’ll head back again – simply because there are too many places around our area to try and also, the crowd here was quite insane, I have my eye on the Pumpkin dish when it happens. I walked home from FireBake that evening just to get moving and to help digest dinner. Flo took the bus because he was due for his evening run that day. He’s currently beginning training for a half-marathon in August! On Sunday, I had my first KOI tea other than sugarless green tea. I finished it! 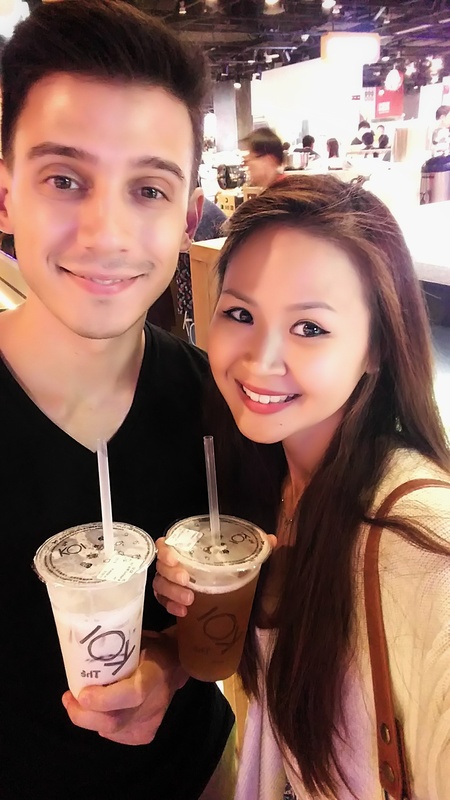 I had a Plum Green Tea and Flo had his usual order of Milk Tea. They used our Chinese Preserved Sour Plum I think so my tea had a nice balance of sweet and tart even with no added sugar. Still not done with food hurdles, we had dim sum at Imperial Treasure Yi Dian Xin (Paragon) for dinner since we were in town and Flo loves these Salted Egg Custard Buns. Without a doubt, these are exceedingly guilt-inducing for me with their rich, luscious, molten lava filling, and I can usually do without them. 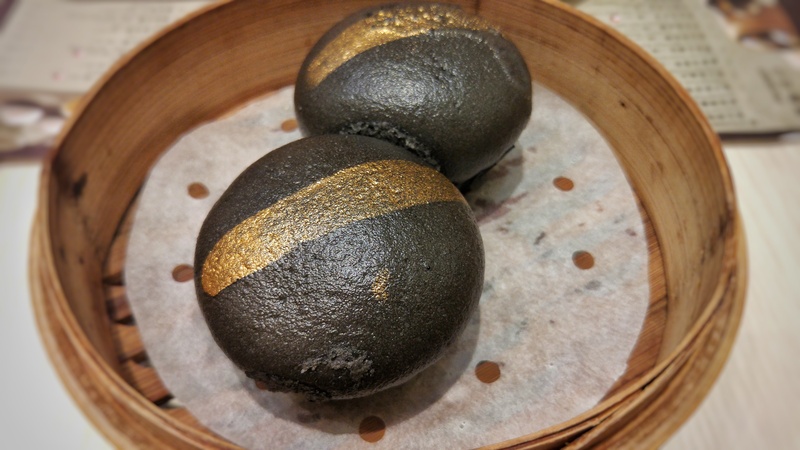 But the boy wants what the boy wants and so we placed an order of these charcoal buns after we had cleared our baskets of the more traditional dumplings. These were good albeit a little on the sweet side. The dough did a good job in countering the sweetness though and while it wasn’t a big portion, it was still quite indulgent to me. I ED felt bad but it was nice being able to share something Flo enjoys and not have to stick to ordering food that only I am comfortable with. 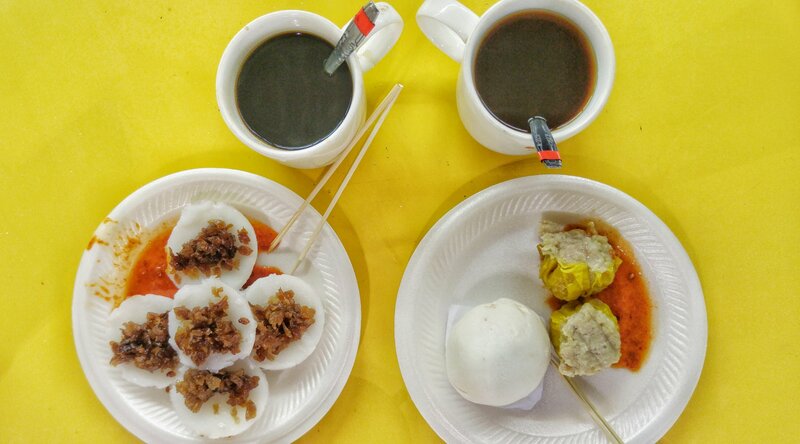 Sunday, Flo and I went downstairs to Haig Road Food Centre for a local breakfast of Chwee Kueh (Steamed Rice Cakes with Preserved Radish), Old school Siew Mai, and a Red Bean Bao. Kopi O for him. Teh O for me. When Flo saw this stall the day before, he got so excited about this breakfast. Altogether, the food alone cost us $3 in total! He likes chwee kueh and I wanted to order soon kueh but they apparently didn’t have it that day. Hence, the two siew mais and the red bean bao. These siew mai are a little different from the ones you get at restaurants in taste. It tasted of childhood and nostalgia to me so I wasn’t sure if Flo would like it, but he did! The bao was ok. Not amazing but the filling was hot and molten so yum! Also, the chwee kueh were actually pretty good considering that they’re not like, a famous stall or anything. The preserved radish was not too oily and the kueh was soft with just enough bite and bounce. We returned to the food centre for lunch again. 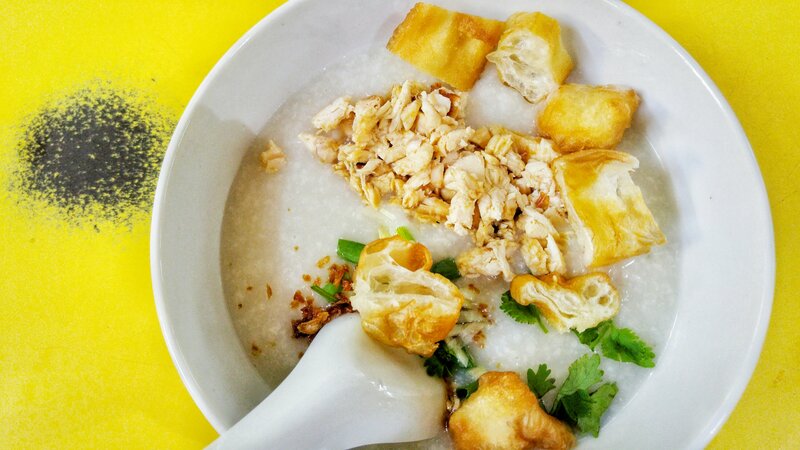 Chicken porridge was cleaned out of its bowl. 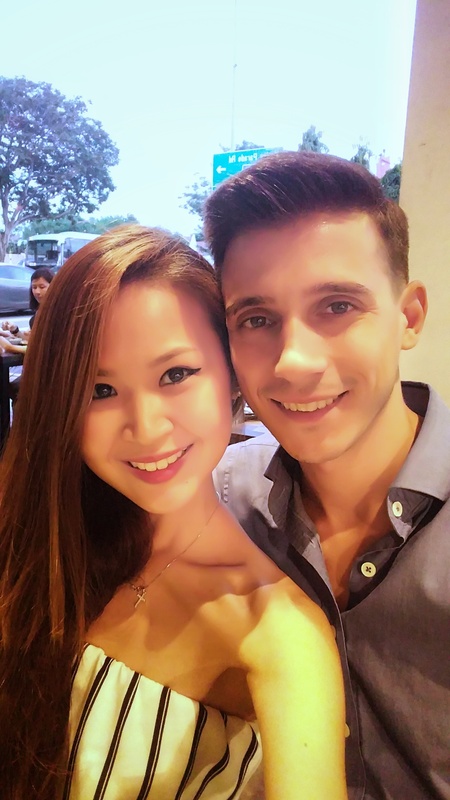 And for dinner, we headed to Esplanade where Flo had a surprise lined up for me. I couldn’t fathom at all what it was because I was sure no musicals or theatre performances started at 9pm. Anyway, we had dinner at Alter Ego first. It’s a place I’ve been wanting to try for a while but because I’d never been before, I was always fearful that the food would be too heavy or too generous in portion for me. I had the Original Poke Shaker consisting of Original Shoyu Salmon on Sushi Rice, served with Lime Avocado, Spiced Roasted Cashews, Pickled Seasonal Veggies and Ikura. It came in what looked like a small bowl but it was piled high with lots of fresh marinated salmon cubes. I loved the lime avocado and spiced cashews! 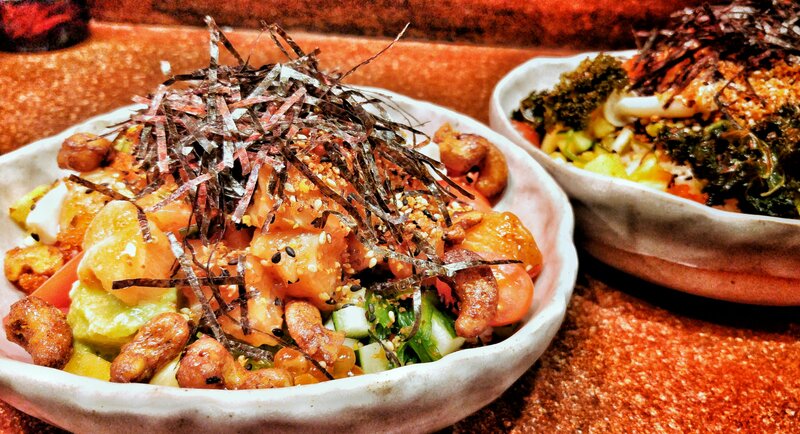 I’ve never had a proper poke bowl apart from the ones I’ve tried making at home. I don’t think mine was too different really except that they have a lot more elements to theirs. The sushi rice with the poke also set theirs apart from my homemade ones. I wasn’t too keen on the bed of carbs below the mound of healthy fats, but given the little push from Flo, I managed. 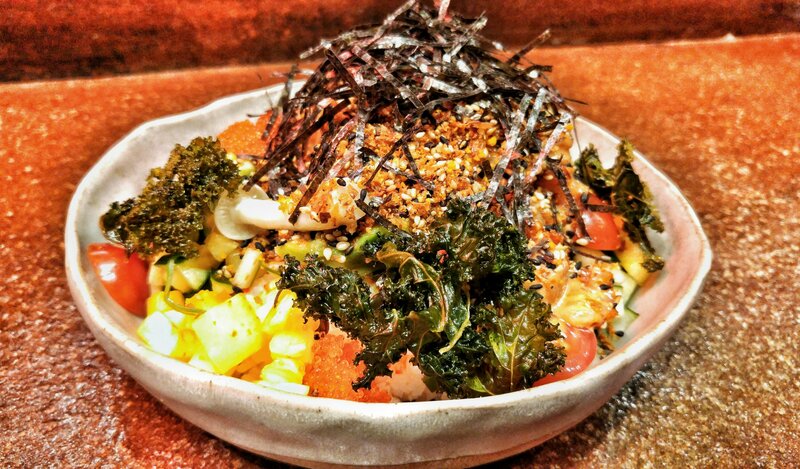 Flo had the Umami Omega – Spicy Garlic Sesame Salmon on Sushi Rice, served with Lime Avocado, Kale Chips, Pickled Seasonal Veggies and Ikura. Similar to mine but with the nice, delicate crunch of kale chips. Also, the salmon was bathed in a creamier marinade that boasted a bit of a spicy kick. Just a bit. With bellies filled, we headed just around the corner to where my surprise was. 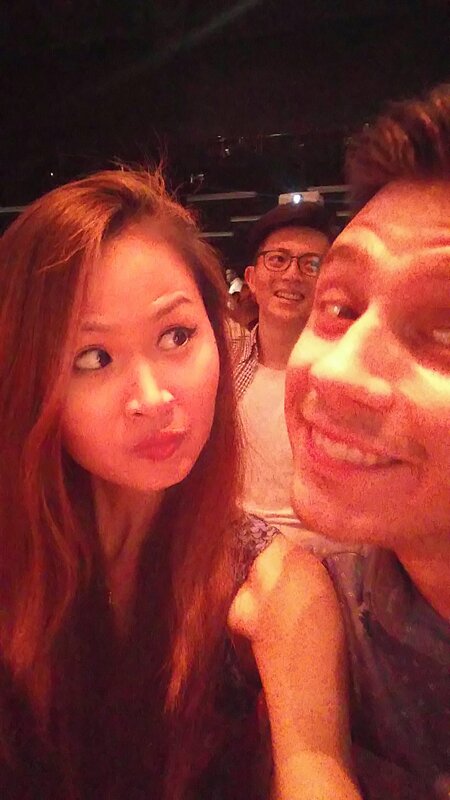 My sweet boyfriend and got us tickets to watch Harith Iskandar, the funniest man in the world (at the moment), live, as one of the highlights of SG Comedy Fringe! 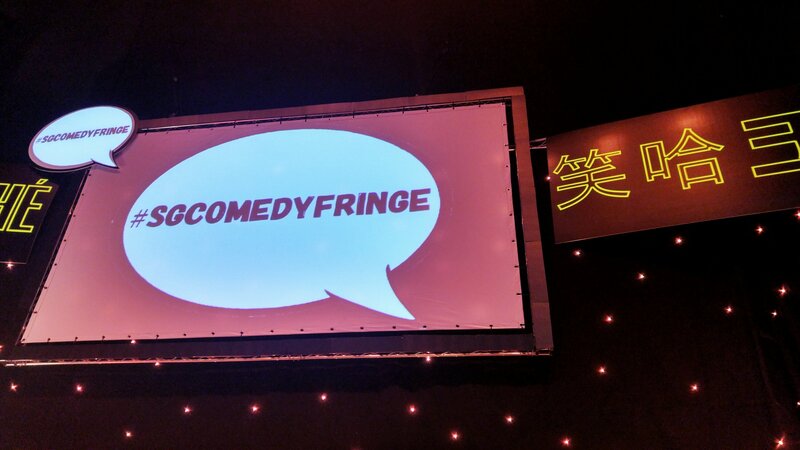 Never have I ever watched stand-up comedy live before and I was really excited. I was also very impressed with Flo for thinking to come watch this. I loved Sam See, who opened for Harith. He’s Singaporean, gay and very witty, and he engaged the crowd with spontaneous humour which is something not easy to do. Harith himself was extremely funny. He touched on many topics that Singaporeans and Malaysians alike could identify with and I think it is the fact that we can relate, that we are able to find the humour in his monologue. He was engaging and present, and when the power went out for a bit, Harith was a trooper and we, as the audience felt no lacking as he carried on making us laugh. It was an awesome night with my awesome boyfriend! So these food hurdles have been teaching me quite a lot recently. There are times where I feel guilty, greedy, fat, uncomfortable, panicky even, after I clean my plate, but more and more, I am also beginning to care less about how many calories I might have consumed, how much more weight I am going to gain, how much fat I have accumulated. I am beginning to relax more and enjoy the process, and see the future in a much more positive light. I am beginning to embrace my womanhood and embrace the fact that my life is so much more, and will be so much more, when I am in good health. Already I can feel the positive effects of recovery on my thinking. I am beginning to differentiate my voice from the ED voice. In other words, I believe that I, Natalie, am becoming stronger, more in control. Sure, ED thoughts still try to hold me back. So right now, Flo’s encouragements help give me that extra boost in getting over those food obstacles. But in time, I know that I will have the strength to get over them myself. It will happen. This may be a very food-centric post, but every one of these meals was an achievement for me and I’m proud that I have been able to eat more carbohydrates (which act as fuel for the brain!) and finish my food. At the end of the day, I want and need to have a healthy relationship with food and with myself so that when I have children, I can be a good influence to them through my actions, and not just my words. Next articleI Bake.Rolling With It.